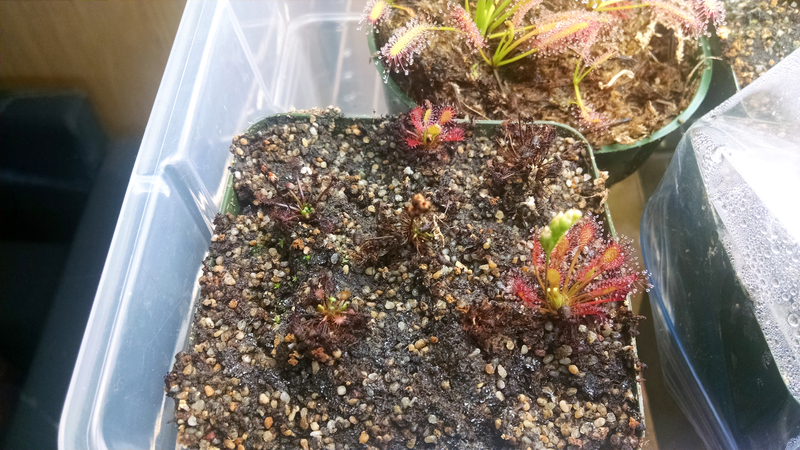 Repotting follow-up, 5 weeks later |Sundews Etc. 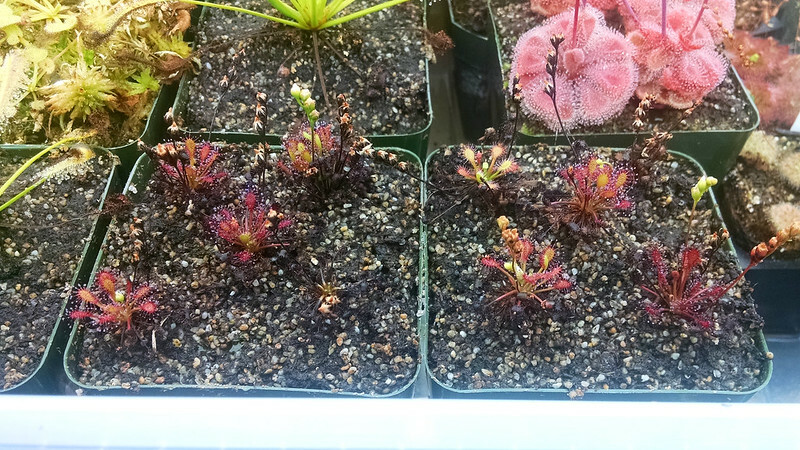 A bit over a month ago I decided it was high time to repot a few sundews, specifically the Drosera intermedia 'Cuba' and Drosera capensis 'Albino' seedlings I'd started around Christmas, and the Drosera admirabilis I'd picked up at the 2014 BACPS Show and Sale. 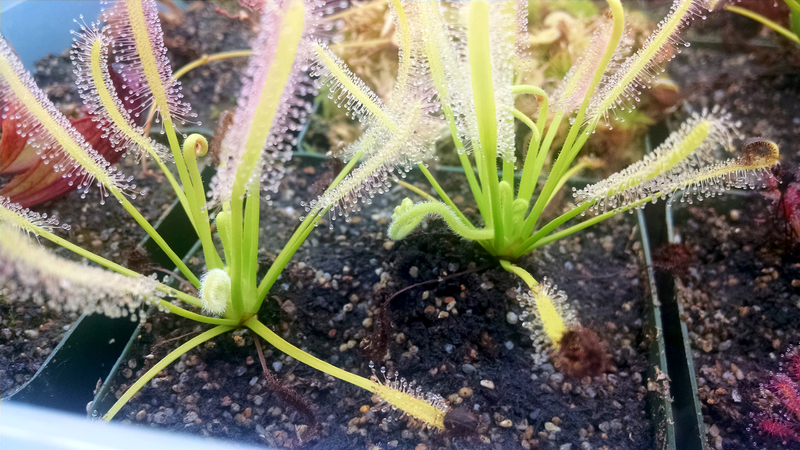 I also decided to finally risk splitting my Drosera capillaris which was cycling back and forth between looking gorgeous and ragged in its growing clump. The biggest challenge, definitely, was the D. intermedia 'Cuba', which were small plants with delicate roots. It didn't help how windy it was the day I decided to do the repotting. Here are my two main pots, which is where I put the 10 largest plants. A couple plants suffered a bit of setback, but over all these were very successful! Pretty good success rate! I definitely lost the plant in the back right. It's all dead. The one in the bottom right-hand corner of the left pot is a bit more up in the air: there is green at the growth point, and little unopened leaves. It may just be holding back before getting back to decent growth. The third pot, which is where all the smaller plants ended up, fared much more poorly. The third D. intermedia 'Cuba' pot, with many losses. As you can see, a couple plants on the left of the pot still have green at the crowns, but overall these were much less successful. That's not surprising though, since they were all on the smaller side to begin with. D. intermedia 'Cuba' has pretty fine roots, and I'm sure some of these plants suffered root damage and died as a result. The D. capensis 'Albino' on the other hand have large, thick roots, and they didn't really even blink when they got repotted. In fact, the largest plant started to bloom immediately after repotting, and the next 2 down in size have followed suit in the last week. Look at the fuzzy little flower stalks. What a big nice plant! It's a pleasure to look at. The smaller plants, which I left in the old pot, didn't even notice any change at all, and they've put on some nice size. It's almost time to pot these guys out themselves! 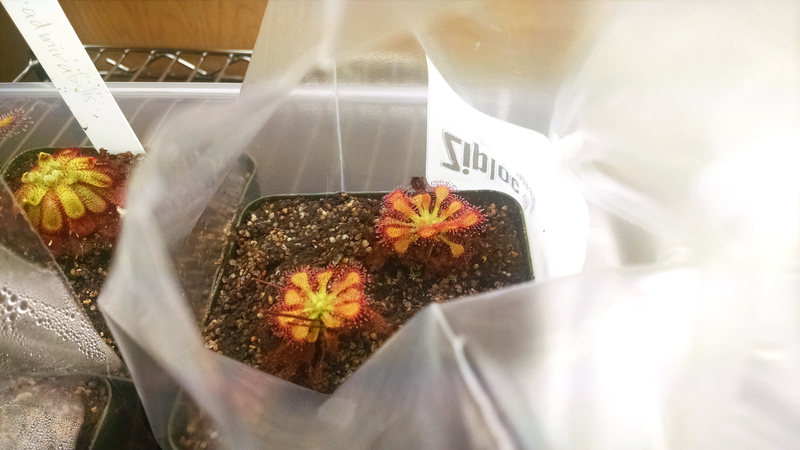 Well, I'm going to be setting up a friend from work with a small growing area, so I'll probably give him one. The D. admirabilis also had a pretty solid root, although it was confined to a small pot. I potted it up to give it more room. Hopefully the plant will settle in and adjust to my conditions well. Leaf size has diminished significantly. That's almost certainly partly a response to increased light intensity. 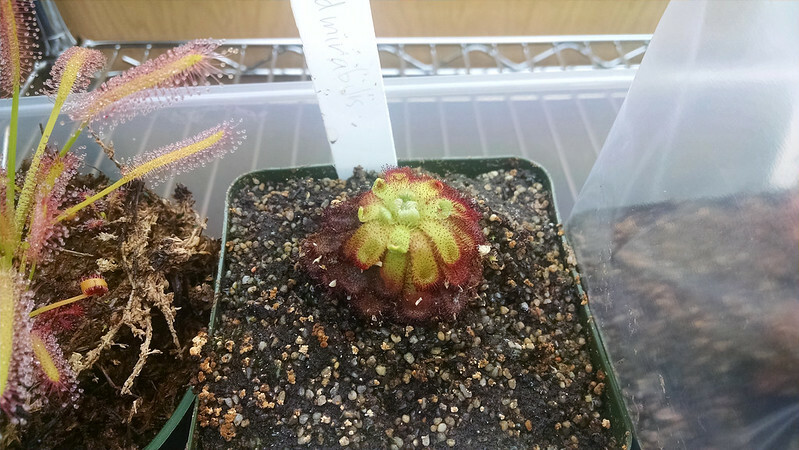 I also think it's probably suffered a bit of heat stress, since there was a period of fairly warm weather shortly after repotting. I expect it to settle in in the next couple months, much as my Drosera aliciae has done (its leaves shrunk initially as well). 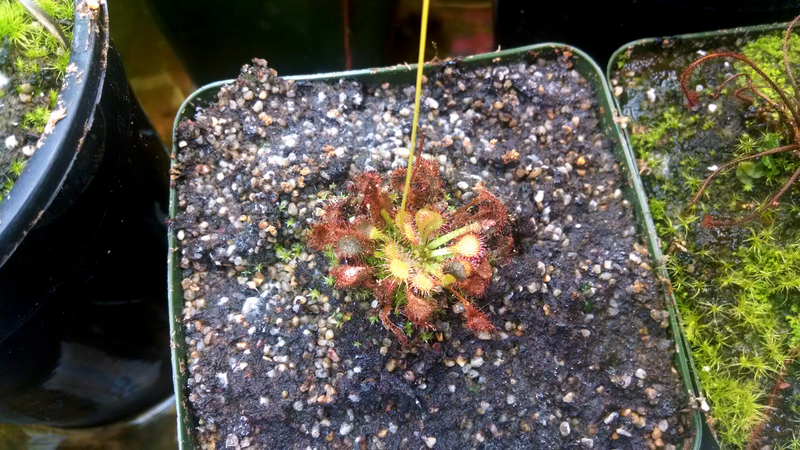 Separating the clump of D. capillaris was almost as hard as repotting a million tiny D. intermedia 'Cuba'. It turns out there were three plants in there, 2 of which were still pretty firmly attached. The largest plant I set out by itself. I wish I'd used a humidity tent! Still doing okay I guess. This plant had a good set of roots and separated cleanly, so I just planted it out and didn't do anything special. As you can see, it suffered a pretty big setback from the experience. For a while I thought I might lose it, but it all of those leaves are new growth and I'm pretty sanguine about its future. The other two plants lost some root and looked ratty in general, so I put them under a bag for boosted humidity. That was definitely the right choice, since now they're doing great! I'm now wishing I'd done the same for the first plant. But these guys are doing great! That's what the tent is for. It's mostly just a fairly full schedule that keeps me from finishing hardening them off. They're both at a much more advanced stage of recovery than the plant which was simply placed in the tray. So what have I learned from this round of repotting? 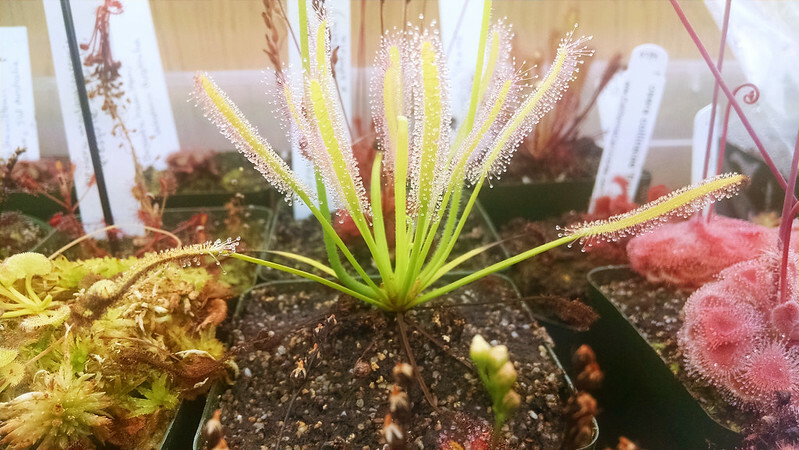 First, D. capensis varieties are really vigorous and a pleasure to work with. That almost goes without saying though. Second, humidity tents work really well to boost recovery. I think I could have saved some of the D. intermedia 'Cuba' I lost if I'd used a tent with them. 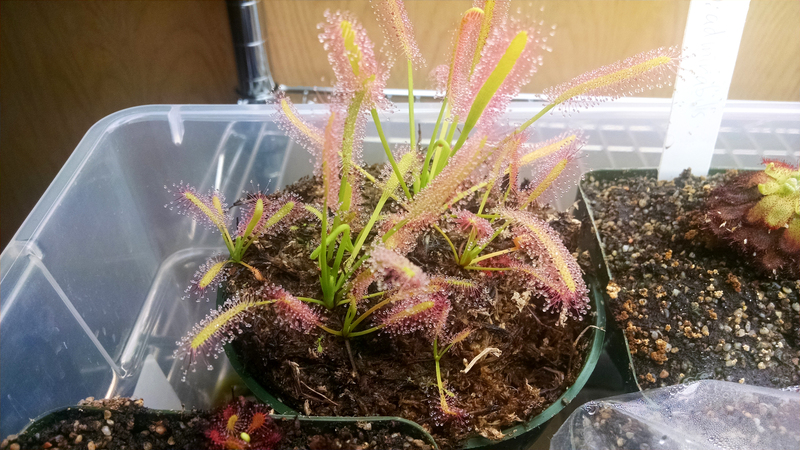 I recently received a small sundew in the mail and used a tent, and it's looking great. Also, don't repot in the wind. The windiness just made it too unpleasant, and I rushed through things. I also think it stressed the plants more than necessary. Finally, I learned to be much more careful when sowing seed. 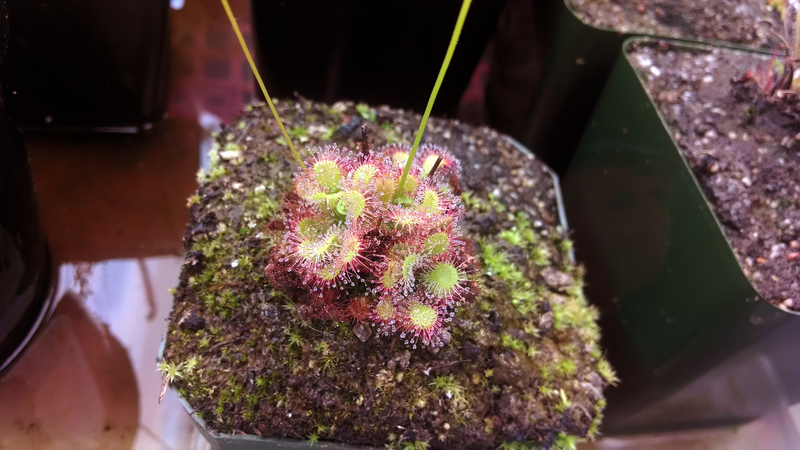 This was early on in my collection, so I didn't really know how to work with sundew seed or what the germination rate would be. Now I'd be much more careful to space everything out more. As I said though, I think this was all pretty successful. I certainly learned a lot, and that makes anything better!